Please join us in congratulating the winners of the 2019 WGSS Research/Creative Projects Competition and WGSS Service Award competition. Whitney Hamilton won the WGSS Graduate Research and Creative Project Competition with the project: “The State of US Breastfeeding Practices: ‘Moving the Needle’ Toward Breastfeeding Equality.” Hamilton is a graduate student in Public Health working with Dr. Yelena Tarasenko and Dr. Julie Reagan. Briana Ladin won the WGSS Undergraduate Research and Creative Project Competition with the project: “Necklines Should Not Encourage Others to Stare.” Ladin is a Fashion Merchandising and Design major working with Dr. Addie Martindale. Ashley Strickland won the Linda Rohrer Paige Award for Service in WGSS competition for their work as GSA President on campus and sustained activism off campus. 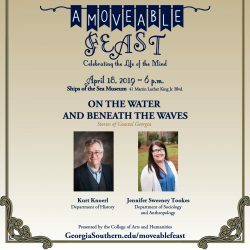 Kurt Knoerl, Department of History, and Jennifer Sweeney Tookes, Department of Sociology and Anthropology, will present “On the Water and Beneath the Waves” Thursday, April 18, at 6 p.m. at the Ships of the Sea Museum located at 41 Martin Luther King Jr. Blvd. in Savannah. See images below for more information. The 2019 CURIO Undergraduate Research Symposium will be held Tuesday, April 16, from 6-9:30 p.m. in the Interdisciplinary Building on the Statesboro Campus. 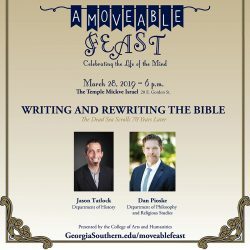 Jason Tatlock, Department of History, and Dan Pioske, Department of Philosophy & Religious Studies, will present “Writing and Rewriting the Bible: The Dead Sea Scrolls 70 Years Later” Thursday, March 28, at 6 p.m. at the Temple Mickve Israel (20 E. Gordon St., Savannah). See the images for more information. One of William Shakespeare’s most enduring comedies will be on display on Georgia Southern University’s Armstrong Campus in Savannah when The Masquers perform “Twelfth Night” at the Jenkins Hall Mainstage Theatre. “Twelfth Night,” directed by professor Peter Mellen, Ph.D., tells the story of twins Sebastian and Viola, as well as nobleman Orsino and Lady Olivia. Viola thinks Sebastian has drowned when the two are separated after being shipwrecked. In order to find work with Orsino, Viola disguises herself as a man, Cesario, which creates a love triangle when Viola (disguised as Cesario) falls in love with Orsino, Orsino falls in love with Olivia and Olivia falls in love with Cesario (Viola). Paloma Whatley, who plays Viola, said a lot of hard work has gone into the production. Mellen said he is treating the show as if Mel Brooks was directing it. “My favorite part of directing a Shakespearean comedy is the moment when the cast realizes this really is funny, and then they start running with it,” Mellen said. The show runs from Nov. 8 through Nov. 11. For more information and to purchase tickets, visit the Armstrong Campus Box Office.